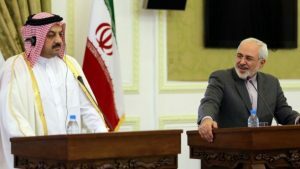 Qatar announced this Thursday the restoration of full diplomatic relations with Iran and the return of its ambassador to Tehran, on the background of the crisis opposing Doha to three of its Gulf neighbors plus Egypt. In a short statement, the Qatari Foreign Ministry said that Qatar wants to further strengthen relations in all fields with Iran, the country with which it shares the largest gas field in the world. Iranian state media acknowledged the development, without elaborating. Qatar’s ambassador to Tehran was recalled in January 2016 following attacks staged against Saudi diplomatic missions in Iran in protest against the execution of prominent Shi’ite leader Nimr al-Nimre by Saudi Arabia. Qatar is headed, like Saudi Arabia and the other Gulf states, by a Sunni dynasty, while Iran is a predominantly Shiite country. On June 5, Saudi Arabia and its allies, namely the United Arab Emirates, Bahrain, and Egypt, broke off relations with Qatar, and enforced a land, sea and air blockade on the tiny Emirate that they accuse of supporting extremist groups and getting closer to Iran. The Saudi-led bloc later on released a list of demands, including reducing ties with Iran, that Qatar should fulfil prior to any normalization of relations. Qatar turned down the demands as an infringement on its sovereignty and has, since the beginning of the Gulf crisis, turned to Iran and Turkey, which both expressed strong solidarity with the Emirate. Written by: KanelkaTagba on August 24, 2017. Posted by KanelkaTagba on Aug 24 2017. Filed under Gulf News, Headlines. You can follow any responses to this entry through the RSS 2.0. Both comments and pings are currently closed.